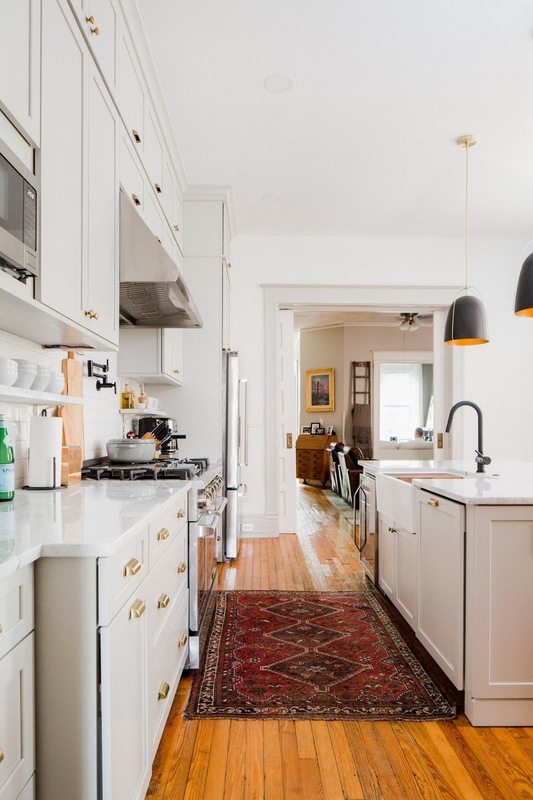 The Reveal: Our Row House Kitchen Renovation is Complete! 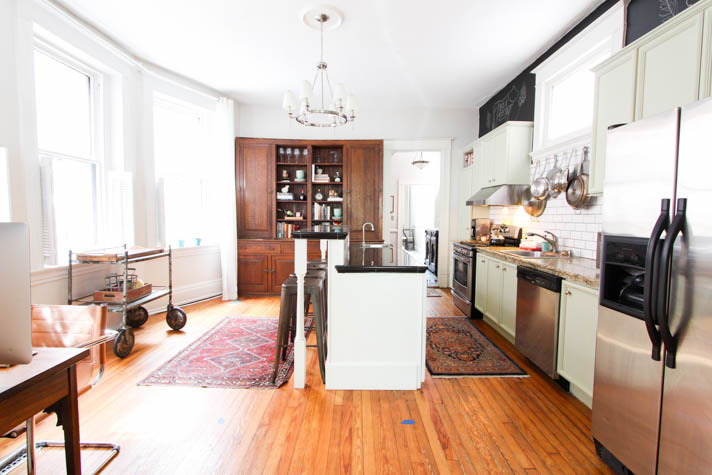 After years of dreaming, and more recently 12 weeks of renovations, our kitchen makeover is officially finished! It's everything we imagined and more, and over the last few weeks we've been getting used to the new layout and spending so much more time in here than ever before. 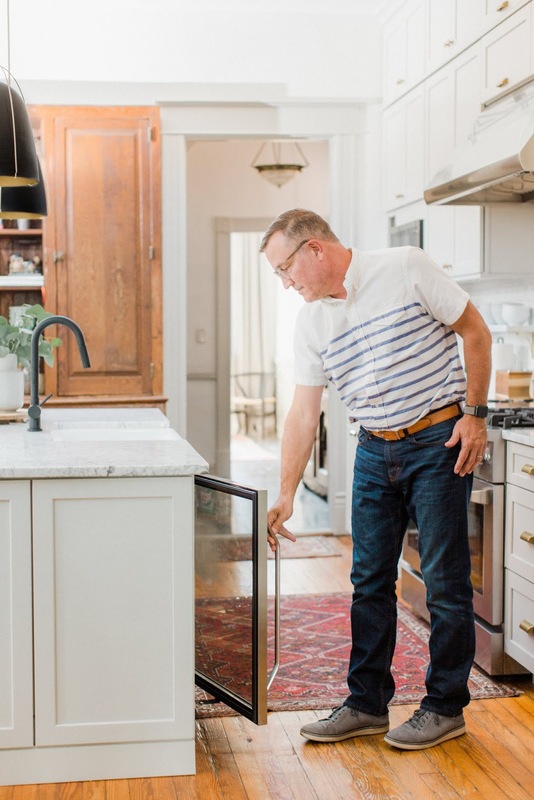 Our kitchen is the heart of our home, and we can't wait to show you every last detail. 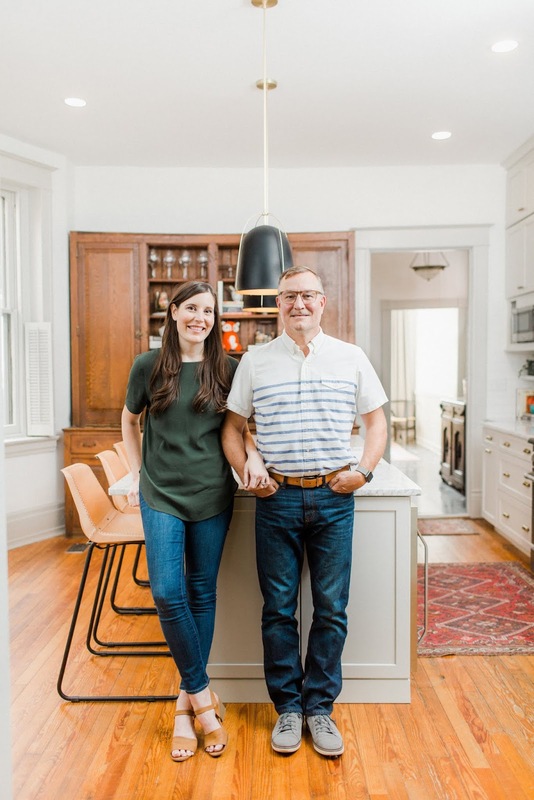 Overall, we wanted to bring the design and functionality up to speed with how we use the space while still honoring the historic character of our home. 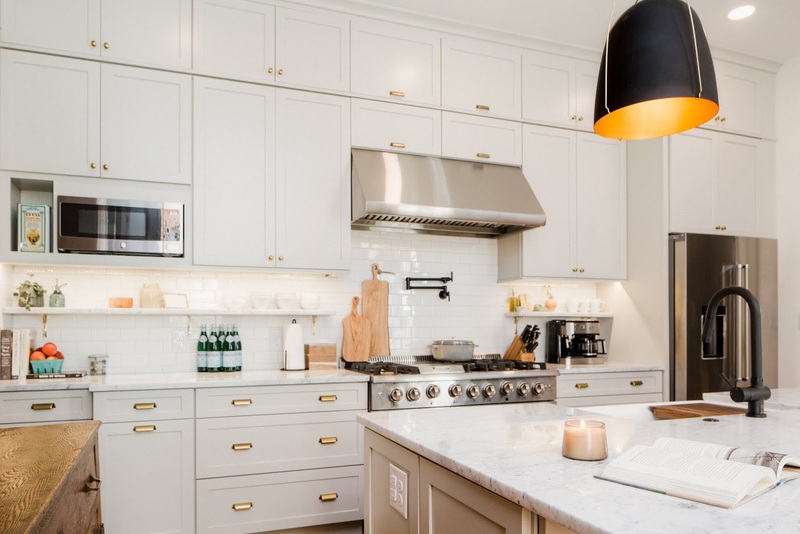 We chose a palette of warm gray, marble, brass and black to mix with the pops of warmer wood tones. 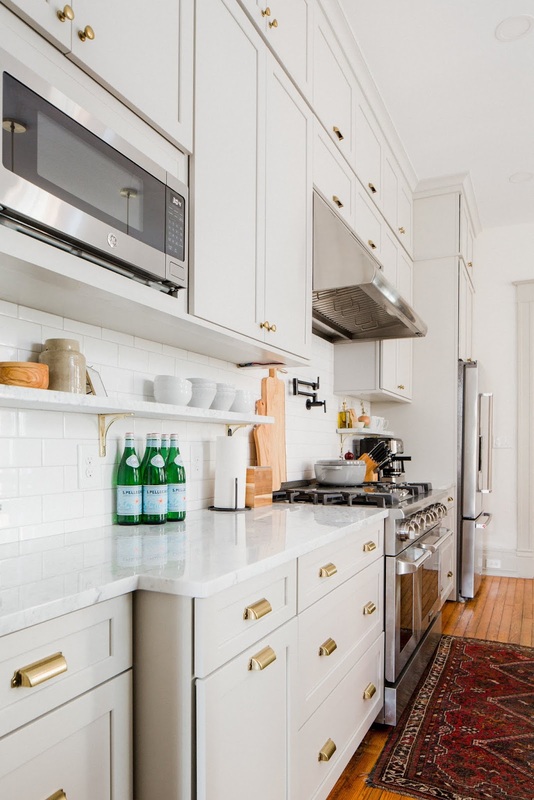 The brass hardware, marble counters and subway tiles helped anchor the historic feel with more modern elements like matte black finishes and updated appliances. 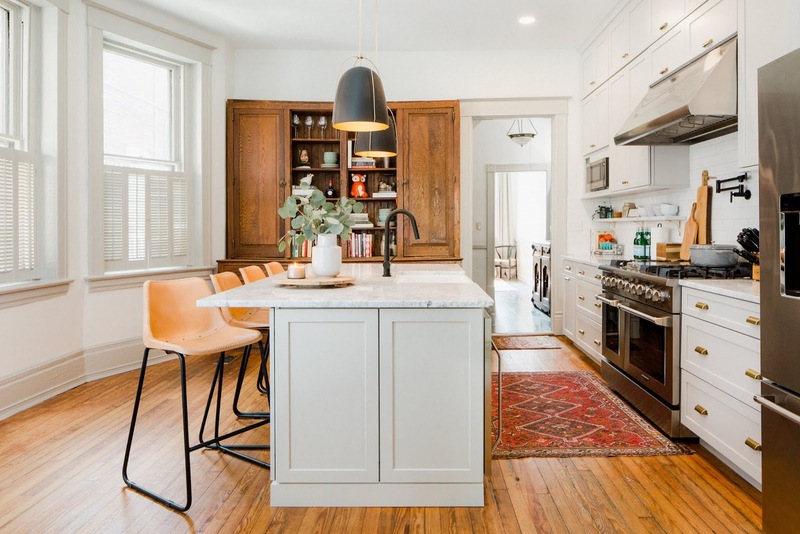 Now that it's all said and done, we can't believe how much lighter, brighter, open and larger the kitchen feels even though we removed a window and enlarged the island without adding any square footage. One of the biggest improvements we made was investing in cabinets that span the full way up to our ceilings. 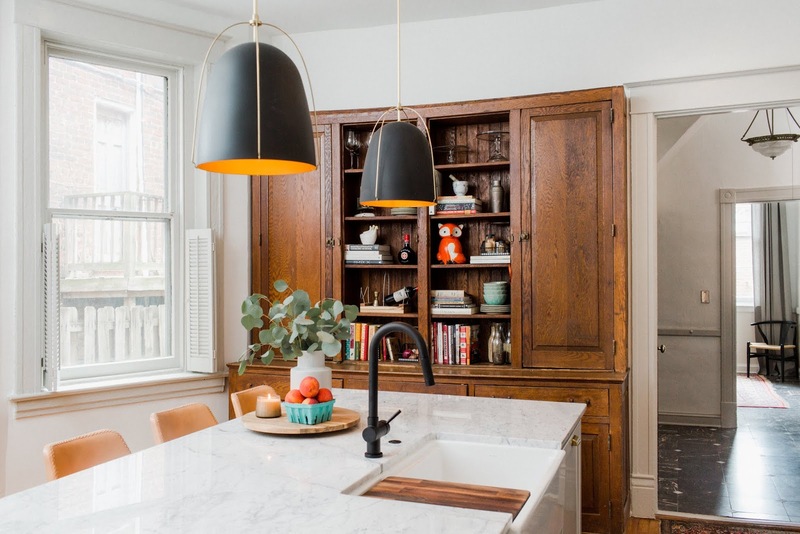 These older row homes are known for their 11 foot ceilings, and bringing the cabinets all the way up instantly made the room feel bigger, not to mention the additional storage space we gained. 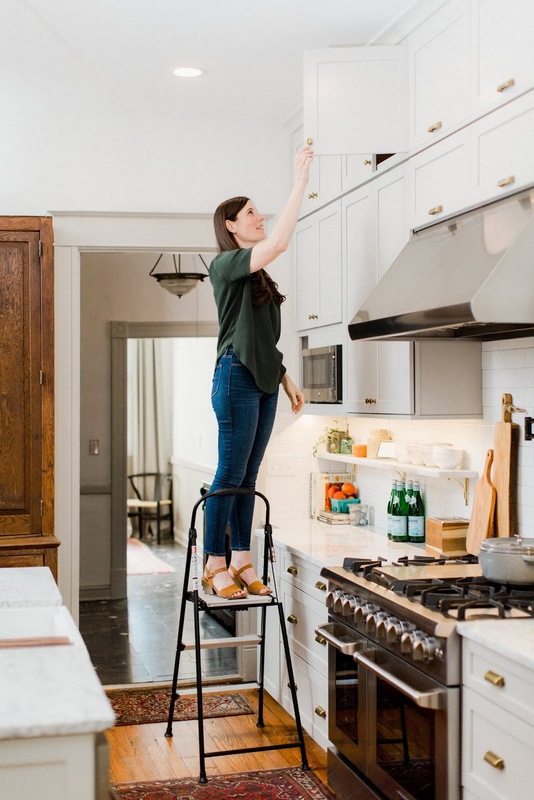 We've gotten the question a lot about what types of things we'll store in the upper most cabinets and while we're definitely keeping more seasonal items up there, they're pretty easy to reach with the help of a three-step ladder. I'm 5'9, so you can get an idea of just how tall our cabinets are in the picture above. It was important to me to keep the stacked cabinets clean looking without too much spacing, so we decided to hang them slightly higher than the standard 18-20 inches you'd typically go above the counter. 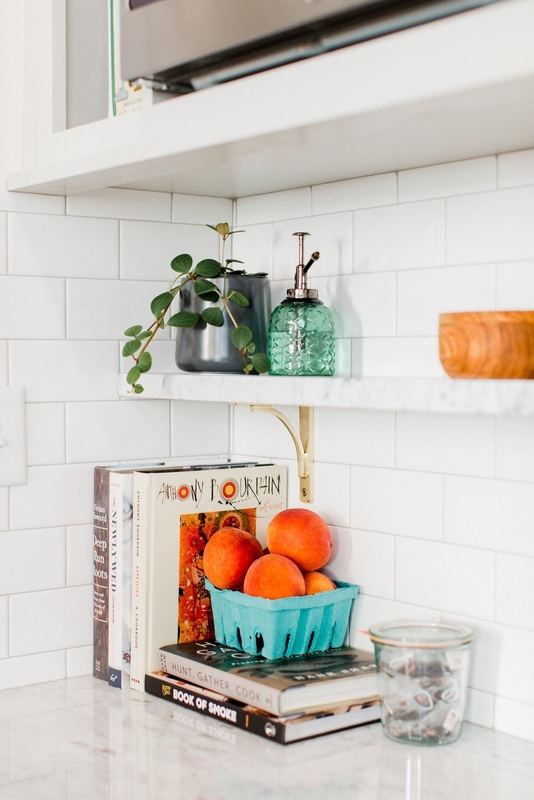 We're both tall, so the added couple of inches isn't an issue and allowed room for the addition of my very favorite feature in the kitchen — our marble shelf. 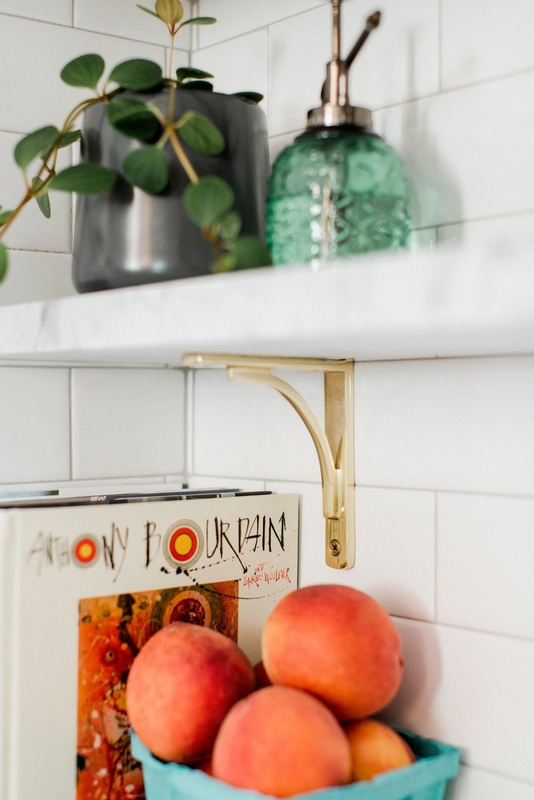 The exposed shelf is made from the same Carrara marble as the countertops and is held in place with beautiful brass brackets that have a timeless feel and play into the history of the home. 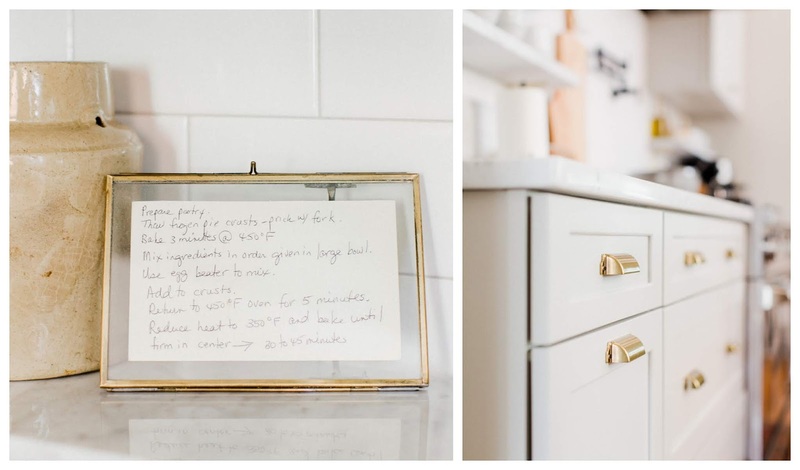 I'm still getting used to styling the shelf, and so far it's been perfect for a mix of the bowls and mugs we reach for the most along with a few more decorative pieces like plants, or a framed recipe of my mother's famous pecan pie. Tim's favorite probably goes without saying, but we updated the layout of the kitchen to center around the 48 inch gas range oven. 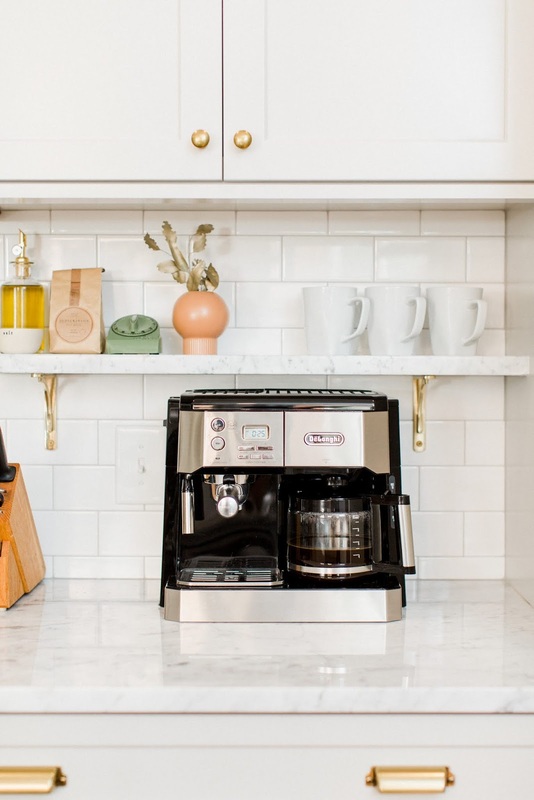 It's a huge upgrade from what we had before and has easily become the focal point and most popular appliance in the kitchen. One change that made all the difference in how much time we spend in here was widening the island. 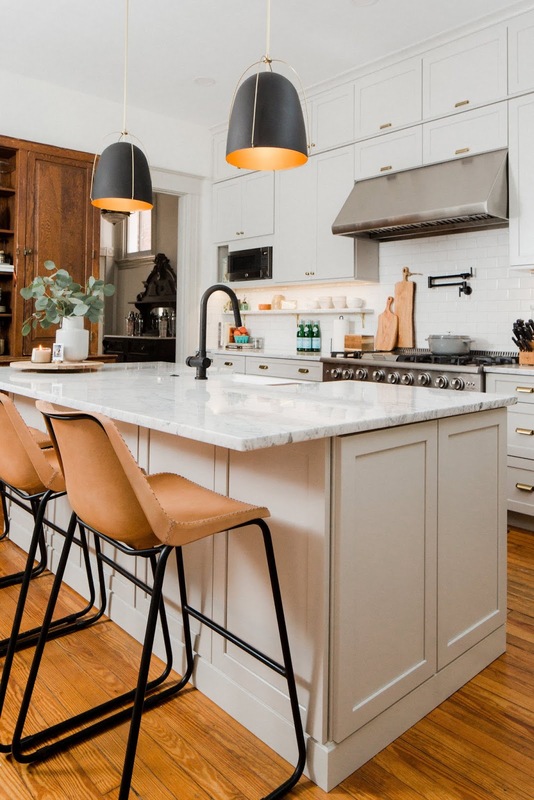 We used to have a tiered island and now with the single height and wider layout, there is so much more room to spread out, food prep and just generally sit down to eat. In fact, our new morning routine involves breakfast and coffee at the island while checking emails and chatting about the day ahead. See the paint color on the window trim and shutters behind us in the photo above? 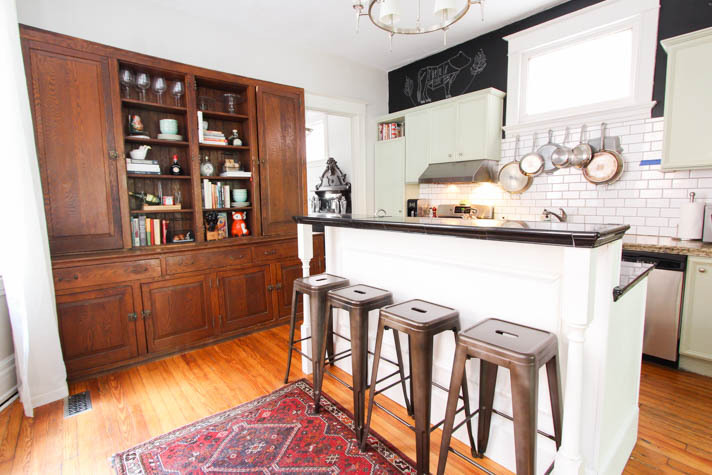 It's subtle, but you might recognize that we had the paint color-matched exactly with the cabinets and painted all of the trim in this same harbor color. 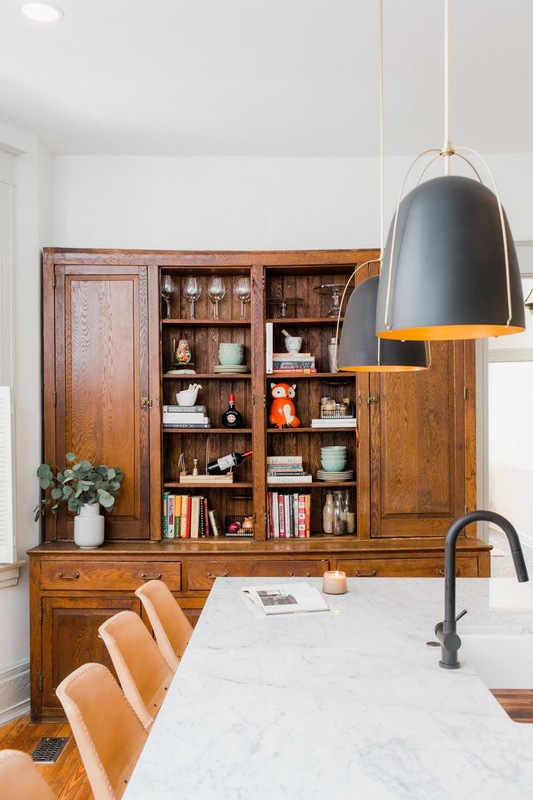 I love how it helps extend the gray from the cabinet wall further into the room. 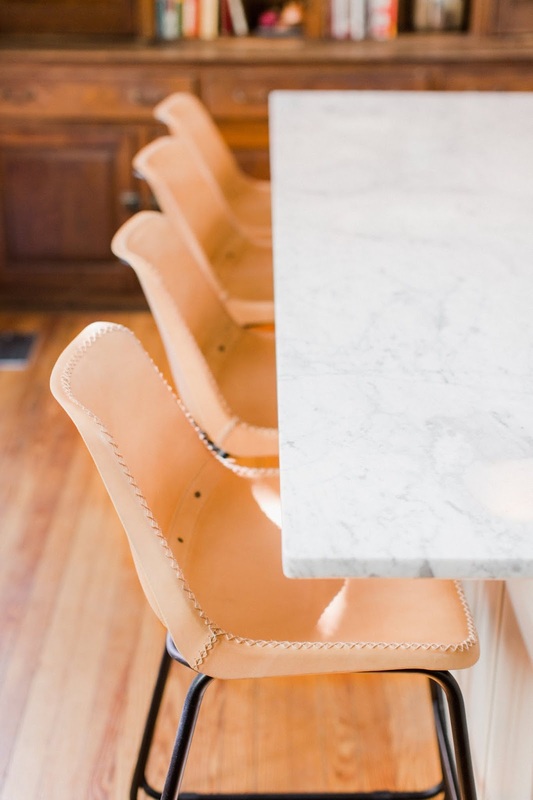 We swapped out our metal bar stools for a sturdier set with bucketed seats and full back support. The leather finish brings a layer of warmth back into the space and is similar in color to the chairs in our front parlor. Because of the open railroad style of our house, it's nice to have elements that tie one room into the next. Can we talk about the island pendants for a minute? They really steal the show, don't they? 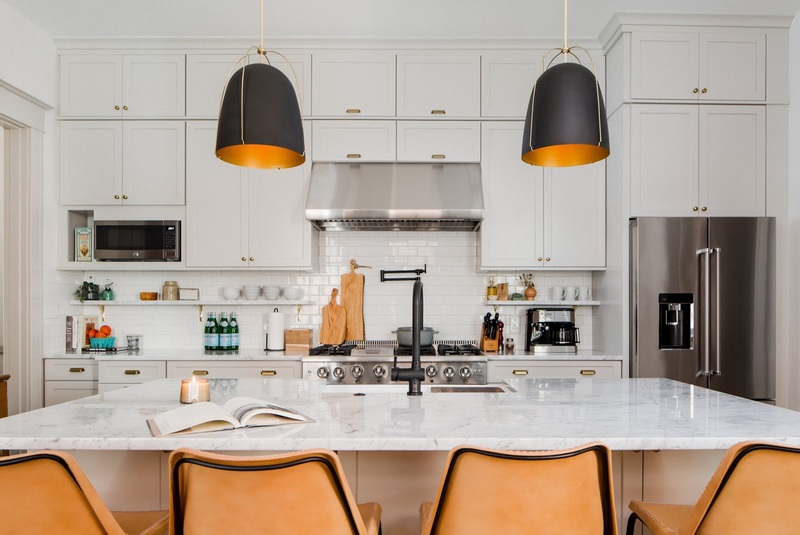 They're the Haleigh design from Rejuvenation and I must have pinned dozens of kitchens with them in it before pulling the trigger. They were still what I'd consider a splurge even though we got them on sale, but one I don't regret for a second. 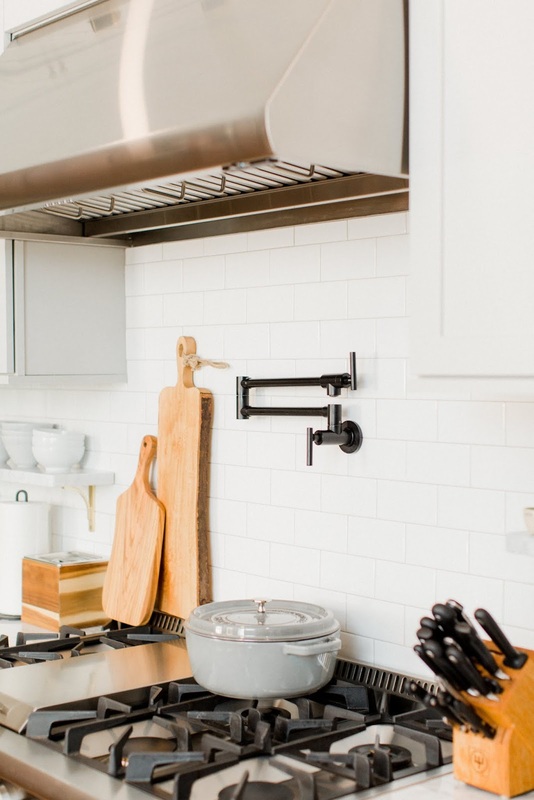 The matte black and brass cage couldn't have been a more perfect fit to tie together the black and brass hardware throughout the rest of the space. 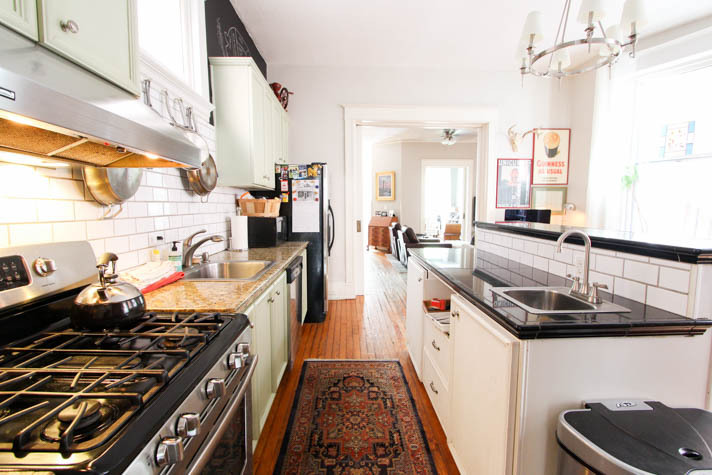 Moving the sink from the wall over to the center island has also made a big difference in how we use the space. 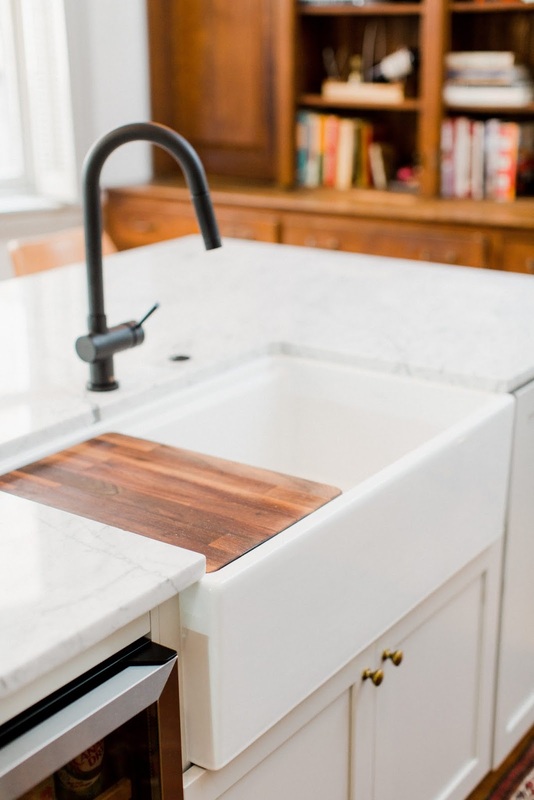 I've dreamed of having a farm sink for years and even though the sink is what held up the renovation (it was a whole saga! ), it's been worth the wait and just what we'd hoped for in the end. 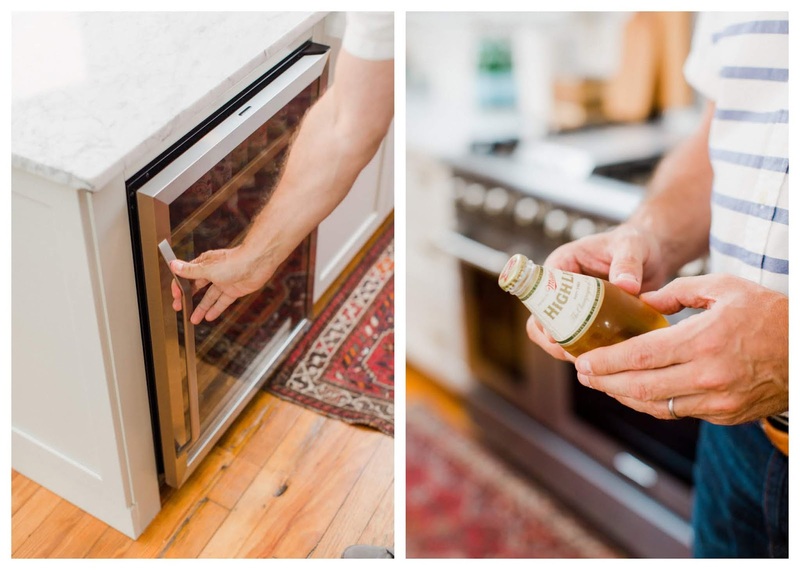 On either side of the sink we installed a cabinet-front dishwasher and smaller beverage center for quick access to soda water, beer and wine. Next to the stove, I think this little fridge is Tim's other favorite part of the kitchen. 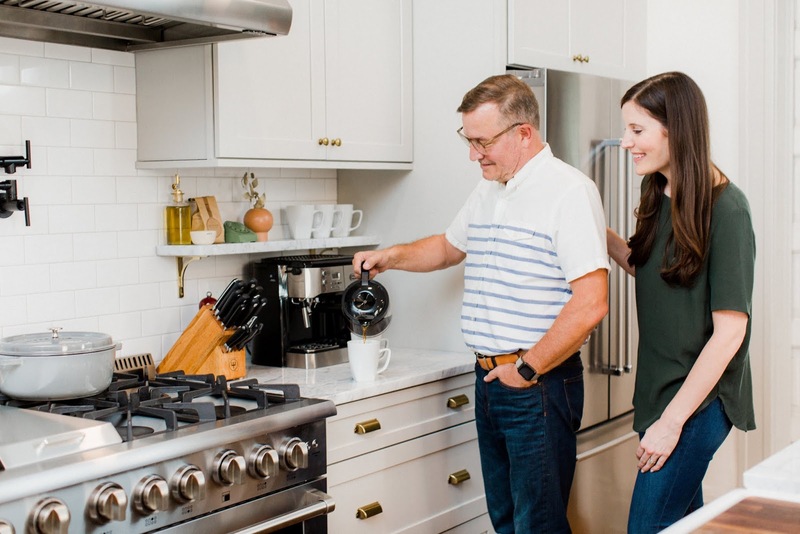 We're using the area to the right of the stove as a coffee nook and place to rest our most used cooking staples like knives, oil, salt and pepper. There are a few things we're still figuring out, like the corner behind the island (we're thinking a dog feeding station and large planter) and the size of the rug we have in here feels a bit wider than I'd like — but these are things that will come with time. If there's anything I've learned, it's that you can't rush a good thing. We'll plan to share a few more details about the kitchen, like the tips and guides we used to help us make different decisions, soon. 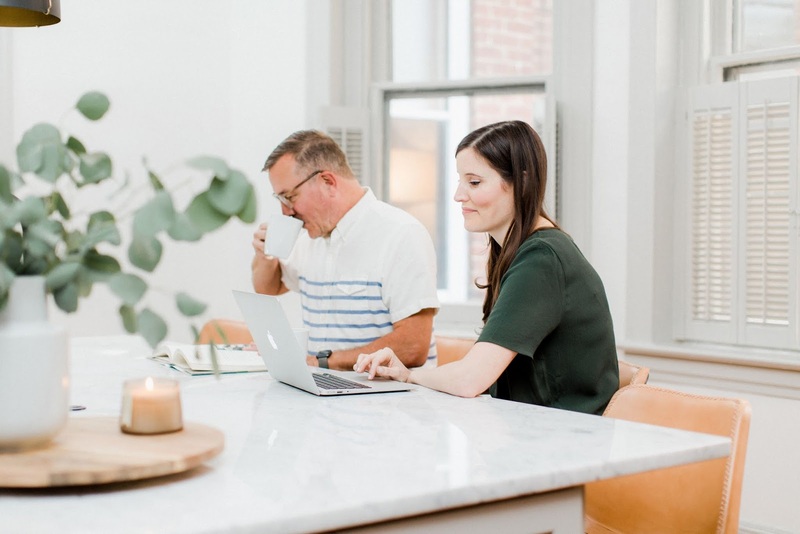 Feel free to let us know if you have any questions in the comments section below and thanks so much for checking in today to see how everything came together! Warm and stunning! Love your posts!